Home › Life@Home › Blink, Missed! One early start a week is, it seems, not enough. Having awoken on Thursday at 5:00 AM to get down to Heathrow and collect our friends, Keith and Marlene Stillman from Richmond, Virginia, today we were roused from sleep at 4:00 AM to go and be guided on a dawn chorus walk listening to the birds waking up. Naturally, we sneaked out quietly and left K & M finishing their sleep. Naturally also, it was raining and pretty gloomy. Nonetheless the walk was well attended by nearly 20 fellow idiots and, despite the weather, the birds cooperated by singing to stake their claims to their prospective patches. After two hours we returned to warm up and begin our second unreasonably early activity. 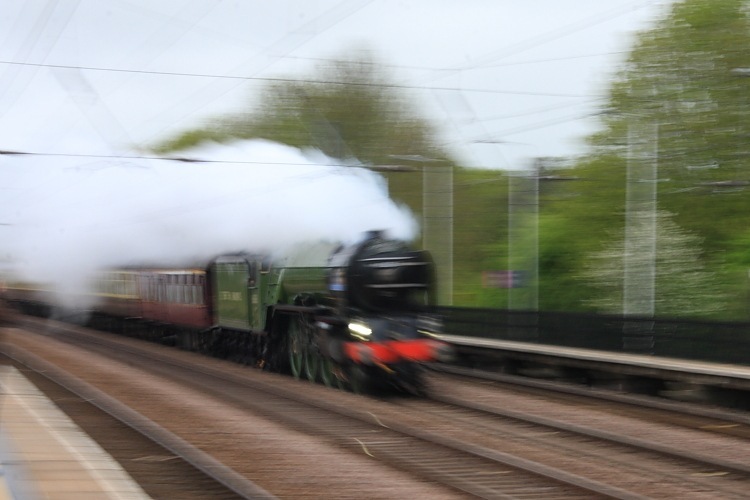 Keith loves steam trains and had discovered that our newish steam locomotive, the Tornado, was travelling up from Kings Cross to Leeds and back today. It was supposed to be hitting Stevenage at 9:05 AM so we decided to drive to Arlesey, a few miles north of Stevenage to see it. 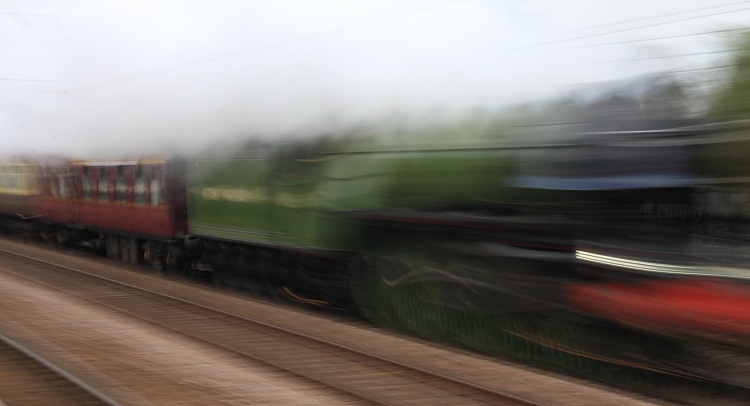 I also thought I’d try a photograph with a slow shutter speed shot for some motion blur. I figured about 9:15 AM at Arlesey would be good and, wanting to allow for traffic and finding a legal parking place, we left at 7:45 AM. There was no traffic; we arrived at Arlesey around 8:15 AM. Our first try produced a good parking spot, too. Keith and I scouted the position at the station; access was unrestricted and we could pick our platform to afford the best view. Not only was it damp but it was also cold, only 8°C, so we returned to the car to keep warm and wait the 45 minutes. 9:00 AM: Sauntered back to the platform and began waiting. 9:10 AM: Another old gentleman arrived to watch and began brain-dumping incomprehensible steam loco data. I listened and attempted to smile at the right points. 9:30 AM: No train, drizzle, cold hands, cold feet. 9:45 AM: A few other “enthusiasts” arrived. Looking more promising. Feet and hands very cold. 9:50 AM: Mobile phone rang – Carol (on opposing platform) had heard that the train had been “rescheduled”; now expected Stevenage at 10:00 AM. 10:00 AM: Hands and feet most closely resembled blocks of ice. 10:15 AM: Hypothermia felt uncomfortably close. 10:17 AM: Action on opposing platform indicated that something might be happening. 10:17:09 AM: A train is approaching very fast. Yikes, it’s the Tornado! 10:17:11 AM: Hurriedly raised camera to eye – frozen finger stabbed button for attempted blurred shot. 10:17:12 AM: Again released shutter – finger probably frozen to camera – as train now level with me. 10:17:20 AM: Rear of train disappears into distance. 10:18 AM: Frozen feet begin plodding back off platform and back to car. Ye Gods that was fast! It was also very quiet; no “chuff, chuff”, no rattling, no nothing. The electric trains had been noisier. Weird! A 4:00 AM start followed by an hour and a half on a freezing platform for approximately 10 seconds of action. Fortunately, Keith took a sensible photograph.